Happy Memorial Day, and Memorial Week ! I would of preferred this post be uploaded by Monday, but there were extenuating circumstances. This is such a meaningful holiday, isn't it? Yet I recently noticed that perhaps flags are not being as proudly flown as often as they once were. Oddly, I also see less of the traditional cook outs in the backyards than we use to take for granted. I spent a part of this last Monday, as I am sure, and certainly hope, that many of you do, visiting cemeteries and tombs to pay my respects. For my immediate family this would mainly be Green Ridge, north of Connellsville, where my closest relatives are buried. These are somber moments that catch me with a tear or two because they are so dearly missed in life. We took flags and flowers with us, although they were needed, since this military cemetery provides them. A little meditation on who they were, and how much they meant to me is to be expected. This is a normal ritual at their grave sides. 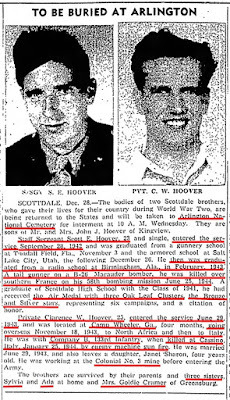 Scott Hoover, known as 'Curly' and Clarence Hoover, nicknamed 'Cougie' as child, were, according to my mother and Aunt Ada and all who personally knew them, very nice, well behaved brothers and young men. Their loving mother, and my grandmother was Ida Mae Hoover; we referred to her in affectionate terms, simply, as 'Nan'. I don't really recall why, except that it's short for Nanny. Her mother was from 'the Old Country', and that meant Germany. The family moved frequently in the early days, after Ida Porch had married John Hoover from Somerset. Standard Shaft, Marguerite, three localities in Kingview, etc. Our Nan, a wonderful, wise and generous grandmother, if ever there was one, had quite a difficult time of things with the tragedy of the deaths of her precious sons, likewise much the same would be said with their father, John Hoover. A carpenter and a coal miner, rarely seen on the strrets without a suit and tie, he only lived to his early 60's before suffering a heart attack. According to my mother, Sylvia Hoover Wilson, he was one of kind too, a very caring and indulgent father. And I could continue that tradition, by sincerely stating that I could not of had a more concerned, loving mother, either. Curly and Cougie were the grandsons of Israel Hoover, and a man who was a Civil War veteran and his story of fearlessness has made him a hard case to follow in bravery. They appear to of done exceptionally well and I am very proud of their service and exploits! They gave their all and their lives for their country. We only have one wish, that we would of known them in their brief years upon this earth. SCOTT EDWIN HOOVER: He was based out of De Ridder, Louisiana and had graduated as an aerial gunner from Tyndall Field in Florida on November 3, 1942. He was then presented with his silver wings and became a sergeant. Next... on the 15th, he transferred to the Second Army Air Force School at the armory of Salt Lake City. Upon finishing his studies on December 26 he was promoted to staff sergeant. He then completed work at a radio school at Birmingham, Alabama by Feb. 1943. His proficiency was as a tail gunner on the B-26 Marauder Bomber. He was on his 58th bombing mission over southern France when he was killed in action on June 25 of 1944. He received the Air Medal with three Oak Leaf Clusters, the Bronze and Silver Stars representing six campaigns with a citation of honor. He was 23 years old. He graduated Scottdale High School from the class of 1941. He entered the Army Air Force on August 29, 1942, a fateful day. 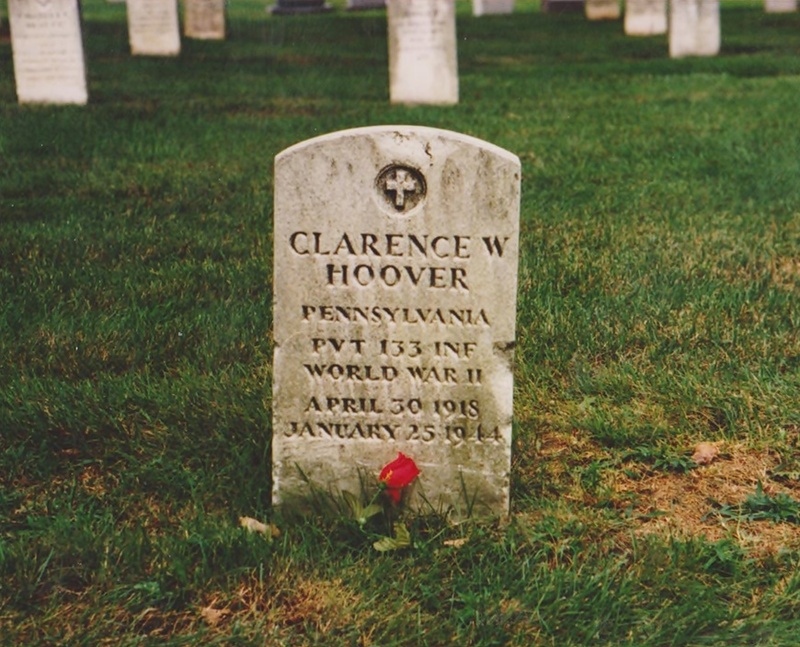 CLARENCE WILLIAM HOOVER: He left for service on June 28, 1943, desiring to follow his brother in service. He left behind him a wife and baby. He was located at Camp Wheeler, Georgia for four months before going overseas on November 18, 1943, first to North Africa and then to Italy. 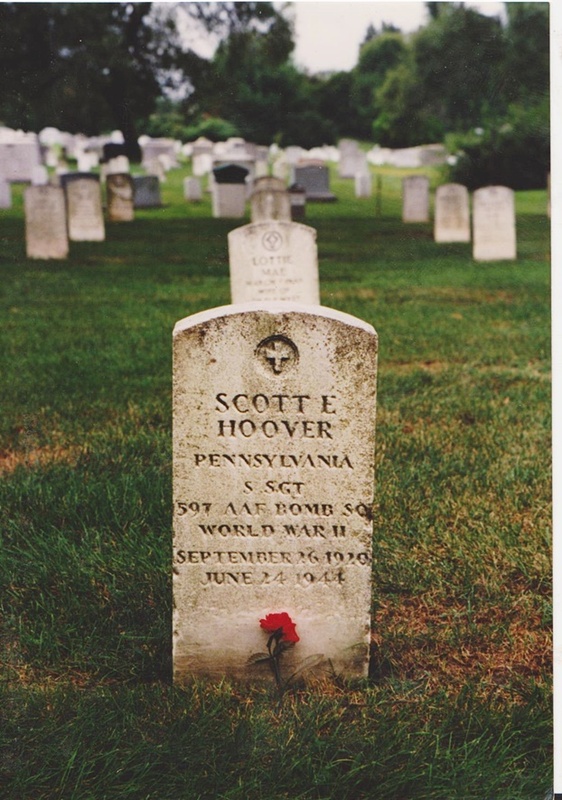 He was with Company B, 133rd Infantry and was in a brutal assault of Patton's where many were considered fodder and casualties even before the mission, if truth be known. That's how things were often done back in those times. 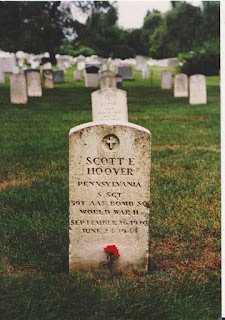 He was killed on January 25 of 1944 at Cassino, Italy by enemy machine gun fire. Previously, he worked hard at the Colonial No. 3 Mine as a coal miner like his father. They were reported missing in action, Scott on June 24, and Clarence on Jan. 25. They were survived by their sisters, Ada and Goldie and Sylvia; she was the youngest of the family, as I am, my mother of blessed memory. Tell me your stories of your favorite relatives with a photo or two, if you wish, I'd be glad to hear from you! There is an old saying which claims that God takes those home to Himself who are particularly special, early in life. Maybe this is so. May they, and yours, truly rest in ETERNAL PEACE, until the Day when they awaken to a glorious Resurrection in the Lord's new world.